Surface Meristem: The cells are not uniform in the appearance and divide anticlinally, periclinally and diagonally. The apical initials have been distinguished in the seedlings of Cycas revolute, but not in mature plants. The cells of this zone rise to epidermis and other apical meristematic zones. Rib Meristem: This is situated in the central region of the apex below the surface layer. The upper region of the zone consists of vertical rows of cells. The basal cells of these rows are large, contain large vacuoles and divide periclinally and diagonally. The pith develops from this zone in Cycas revolute. The Peripheral Meristem: This cells of this zone are small and are generally elongated. This zone enlarges by the cell division within the zone itself and by the addition of cells from the surface layer and from the periphery of the rib meristem. In Cycas revolute, the cortex, the pro-cambium and the leaf primordia develop from this zone. In this type, type five meristematic zones can be distinguished into the apex. The Zone of Central Mother Cells. The Rib Meristem: This zone is responsible for the development of the pith of the stem. Cambium-Like Transitional Zone: This cup-shaped transitional zone present between the central mother cells and the rib and peripheral meristems. The cells of this zone divide mostly by periclinal divisions. Cortex, Leaf Primordia, Pro-cambium and in certain plants outer region of pith develops from this zone. Ginko biloba, Zamia spp., Sequoia sempervirens, Pseudotuga taxifolia have Ginko type of apices. Four meristematic zones are distinguished in this type. The cambium-like transitional zone is absent and the remaining zones are as in Ginko type. Pinus montana, Sequoia gigantea, Abies concolor, Taxus bacata and Cryptomeria japonica exhibit this type of apex. A leaf is initiated by periclinal divisions in a small group of cells in the peripheral zone of an apical meristem. In the dicots, the first periclinal divisions initiating the leaves take place in the subsurface layer and are followed by similar divisions in the third layer, and by anticlinal divisions in the surface layer. In some monocots, the surface layer also undergoes periclinal divisions and give rise to some or most of the internal tissue of the leaf in addition to the epidermis. 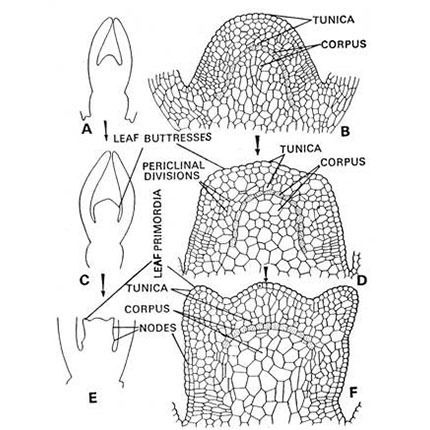 In angiosperms, the depth of tunica and corpus is variable, therefore, the tunica and corpus are variously concerned with leaf formation. In gymnosperms, the leaves arise in the peripheral zone. The surface layer may contribute cells to the internal tissue of the primordium by periclinal and other divisions. In lower vascular plants, the leaves arise from either single superficial cell or groups of superficial cells, one of which enlarges and becomes apical cell of the primordium. A lateral prominence is formed on the side of the shoot apex due to divisions which result in the initiation of a leaf primordium. This prominence is called Leaf Buttress. The leaf grows upward from the buttress. Depending on the level at which a leaf primordium is initiated, the shoot apex may or may not change in shape and structure during the period between the initiation of two successive leaf primordia. This period is termed as Plastochron. The changes in the shape and structure of shoot apex during one plastochron are referred as Plastochronic Changes. Before initial ion of a new leaf primordium the apical meristem appears as a rounded mound (heap). It gradually widens. Then the leaf buttresses are initiated on its sides. During the growth of leaf primordia, from the buttresses, the apical meristem again assumes the appearance of a small mound. The branches of the shoot originate at the shoot apex. In many pteridophytes and in a few angiosperms, the branching is brought about by the single apical cell or group of apical cells in to two, as a result of which two apices are formed. This type of branching is called Dichotomous Branching. When a branch arises laterally at the apical meristem, this type of branching is termed as Monopodial. In some pteridophytes and in some spermatophytes, lateral Axillary Buds are initiated in the axils of leaf primordia. These buds are responsible for the formation of branches. It is not clear whether the meristem of the axillary bud is derived from the apical meristem of the main shoot or it originates from partly differentiated tissue of the internode because the axillary buds commonly initiate somewhat later than the leaves bearing them. Both the cases are found in plants. In seed plants, the axillary bud is initiated by a combination of anticlinal divisions, in one or more superficial layers of the young axis, and of various divisions, sometimes predominately periclinal, in the deeper layers. This coordinated growth in the surface area and in volume in greater depth causes the bud to protrude above the surface of the axis. 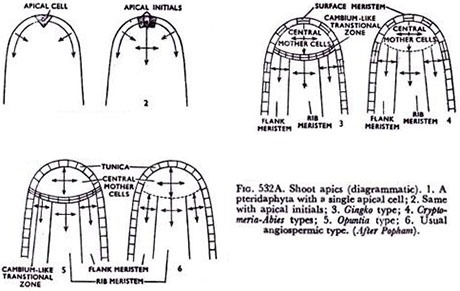 Depending on the quantitative relationship between the tunica and the corpus in the shoot apices of spermatophytes, the derivatives of the two zones variously participate in the formation of axillary bud meristem. If the axillary bud develops into a shoot. Its apical meristem gradually organizes commonly duplicating the pattern found in the parent shoot apex and proceeds with the formation of leaves. Buds that arise without connection with the apical meristem from more or less mature tissues are classified as Adventitious Buds. Adventitious buds occur on stems, roots and leaves. Adventitious may originate more or less deeply in the tissue or in the epidermis. Axillary buds are described as arising exogenously, i.e., in relatively superficial tissues. The adventitious buds may be exogenous or endogenous, i.e., initiated deeply in parent axis.